How is it possible that an indirect flight is shorter than a direct one? Got a very odd result from Kayak when searching for some flights. It claims that the indirect route, including stop-over time, is faster than the direct one. Is this even possible or an error? Going direct from YUL to PLS takes 7 hours and 5 minutes while making a 1 hour and 21 minute stop in Toronto shorten the duration to 6 hours and 35 minutes as shown above. Flights all on Air Canada. Now basic geometry says the shortest path on a plane is a straight line but since the earth is curved, it must not be so but could the difference be so great as to eclipse a 1h21m layover? Notice the return leg has a 7 hour layover, so it is indeed faster to go direct. 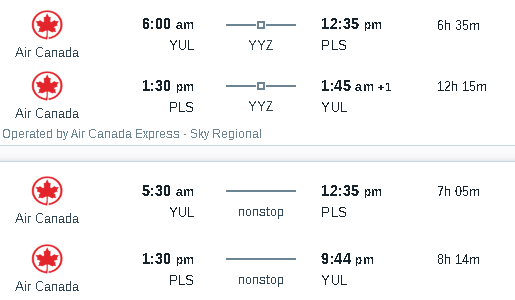 Apparently Air Canada has a non-stop from PLS to YUL on Tuesdays (AC1801) which has an official flight time of 4:05. There is no non-stop the other way. The outbound AC1802 flies through ZSA, so it's a YUL-ZSA-PLS-YUL route. I had a similar issue on Kayak recently. It was showing a direct LAS-CDG flight which surprised me a lot. It turned out to be a flight with a connection in SLC. The two legs had the same flight number, but different aircraft. As Kayak retrieve offers from partner sites, it apparently happens that some of the information is sometimes lost in transit (either between the airline and the partner site, or between the partner site and Kayak), and a flight with a stop (which actually looks more like a connection than a stop since the aircraft was different) is shown as non-stop. Can I skip an indirect flight? Flights - Direct in one direction, but with at least 1 stopover on the other? Is there a flight search engine that allows me to pick the departure and return flight separately? Do I need transit visa for my direct flight that stops in the UK?